When hiking, alone and sleepy, though a dark, pre-dawn, dense forest of tall lodgepole pine, every shadow and tree stump looks like a bear. It’s a great way to get your heart rate going early in the morning. 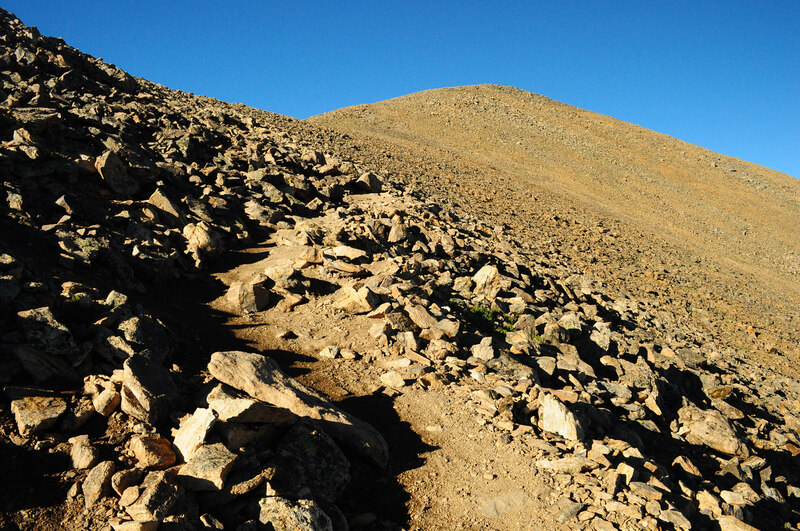 I had risen from my restful (save for some early morning screaming and yelling coming from the campground across the road) sleep at 4:30 A.M. in an attempt to climb Colorado’s highest peak, Mt. Elbert, without getting myself electrocuted. I found myself mentally preparing to defend my White Chocolate Macadamia Nut ClifBar to the death at least half a dozen times over a 1 hour period. Not only is Mt. Elbert the highest point in Colorado, it is also the highest point in the Rocky Mountains as well as the 2nd highest point in the entire continental United States, just 65 feet lower than California’s Mt. Whitney. Despite its height, the summit of Mt. Elbert can be reached via several well-traveled trails. All require a fair bit of elevation gain but the one I was forced to use as a result of not possessing a 4WD vehicle climbs 4,900 feet in 4.5 miles, a healthy climb regardless of altitude. Summer is generally considered a bad time to climb any peak that involves spending time above treeline because of the summer monsoon thunderstorms that are ubiquitous across the southwest. Unlike its Indian counterpart, the southwest monsoon generally doesn’t deposit several feet of rain on the surface (although they can produce some locally heavy, but brief, downpours) but they can, and often do, produce copious quantities of lightning. Lightning, as you most likely know, hits high places. Mt. Elbert is the highest point in Colorado. A person standing on Mt. Elbert, would then, by extension, temporarily be the highest thing still attached to the ground in Colorado. Put two and two together and you can see this makes for a potentially life-threatening situation. The problem with these lightning storms is that they can develop incredibly rapidly and without warning out of clear blue sky. Your best chances of avoiding them is to hike early….really early. I camped about 100 yards from the Mt. Elbert trailhead the night before the hike. A developed forest service campground was located directly across from the trailhead whose “services” I could utilized for $15 per night. Option #2 was to drive across the road and set up camp in a small clearing for $0 per night. The only things I would be missing (considering that I could simply walk across the road to use the water spigots) were the fire pit and picnic tables located in each developd campsite. Considering that I was alone (thus making a picnic table a bit unnecessary) and that a complete fire ban was in effect, I decided to save my hard-earned moolah. Treeline on Mt. Elbert invokes no such warm and fuzzy feelings. Rather, treeline on Mt. Elbert is merely a courtesy reminder that you are less than halfway there and that you still have more than 3,000 vertical feet to climb through ever decreasing oxygen levels. And the vistas aren’t anything to write home about from this point to boot. Breaking out of the trees at 11,500’…still 3,000′ to go! One of the few inhabitants of the upper mountain, the American Pika is a small, elusive rodent that call the scree slopes its humble home. Mt. Elbert also redefines the term “false summit.” Fortunately, for my sanity, I had thoroughly read a number of guidebooks and was well prepared for this matter. Good thing otherwise I probably would have consider hanging myself after reaching the 2nd one and finding the true summit still out of my reach (fortunately, the lack of trees would have made this a tricky proposition…). On the way down, I encountered a number of weary and inquisitive hiking parties just below the lower-most and most evil false summit (still nearly 1000 vertical feet from the true summit) whom I regrettably had to inform that they still had a good hour or more of trudging to go. Judging by their reactions and creative use of profane adjectives, they were not as well-prepared for this as I was. Nearing the first of the false summits. This one is particularly nasty since it is in plain view from the beginning of the trail. Skirting around the edge of false summit #1, false summit #2 comes into view…. …and then the true summit finally appears on the horizon! The view from the summit is, as would be expected, spectacular, although not necessarily any better than a number of other, lesser peaks in Colorado. Mountains fill the field of view as far as the eye can see in all directions. Several other Sawatch Range 14ers are visible from the summit including Colorado’s 2nd highest peak, Mt. Massive to the north (Mt. Massive is aptly named, it consists of four individual peaks of 14,000+feet along a 5 mile ridge) and La Plata Peak to the south. The view on a clear day (which it was) stretches all the way to Pikes Peak outside of Colorado Springs, almost 100 miles to the southeast, and the Maroon Bells outside of Aspen. Being the first person apart from the overachieving group of scouts to summit that morning, I had the place all to myself for about half an hour. By the time summit-er #2 showed up at about quarter to 9, clouds were already starting to build up around the mountain so I decided to head back down. View to the south along the Sawatch Range from Mt. Elbert. 14,000 foot peaks and other notable summits are labeled. View to the north from Mt. Elbert. The mutiple peaks of Mt. Massive are at right. The prominent ridgeline in front of Mt. Massive is the ridge followed by the Mt. Elbert trail. Sadly, having reached the highest peak in the Rockies, my options for setting a new personal elevation record are now somewhat limited unless Warren Buffet unexpectedly names me in his inheritance or I find a big bag of money on the street (those are pretty much the same if you think about it…) and decide to go to Alaska or South America (to make a donation, you can find my contact information on the About page). Or, on a slightly cheaper thought, Mt. Whitney anyone? This entry was posted on July 19, 2012 by Zach Schierl. 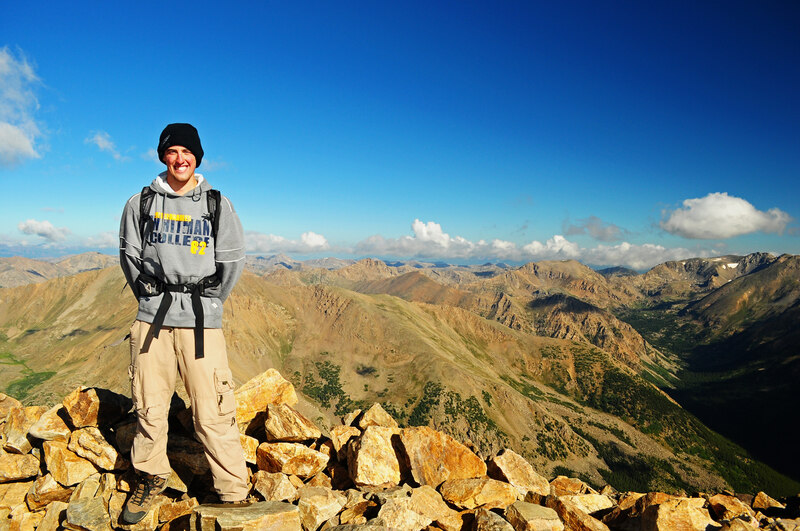 It was filed under Colorado, Hiking, Panoramas, Peaks and was tagged with 14er, Colorado, elbert, Mt. Elbert, mt. elbert trail, pika, rocky mountains.